In a previous post, I reviewed Buddha Collapsed Out of Shame (2007), directed by the young Irani filmmaker, Hana Makhmalbaf. She developed the film's script, about a young girl's attempts to go to school in Afghanistan, with her mother, Marzieh Meshkini (below right). 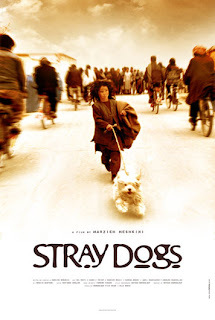 It is by coincidence that I selected to watch (as part of my ongoing research on human rights and film) the movie under review in this post, Stray Dogs (2004), on the same day as I watched Buddha – without knowing that the maker of Stray Dogs was Meshkini, mother of Makhmalbaf, the maker of Buddha. ► The cruelty of the young boys as they endeavour to burn a dog to death. ► The touching portrait of children, stoic and self-sufficient against the indifference of adults. Stray Dogs tells the story of two children and the dog they rescue. Calling themselves 'night prisoners', the children visit their mother at night and sleep with her – in jail. The father of the children had fought against the Americans and been presumed dead for five years, in which time the mother remarried. The mother then found herself in prison for 'adultery'. The father is also in prison, and is subsequently moved to Guantánamo Bay, leaving the children homeless. Human beings are members of one another. As they have been created from one essence. When one member suffers pain. The other members become restless. If you are indifferent to other people’s woes.